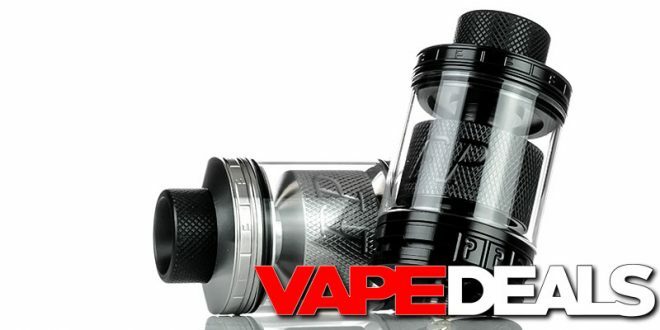 It looks like both colorways (stainless steel and black) of the Blitz FP RTA are finally back in stock over at dna. You could bring one home for only $26.99 if you apply coupon code “deals10” at checkout. Not a bad price coming from a US vendor. I really like the build deck on this one too. It’s almost like a dual coil version of the Kylin Mini…except with Ghoul RDA clamps! Very cool. If you don’t mind the wait, you could save a few dollars and pick up the Blitz FP RTA from an overseas vendor. 3fvape just dropped the price of the stainless steel version down to $23.59. Plus, you can still get an additional 5% off with coupon code “HALLOWEEN2018”. That works out to just $22.41 + FREE shipping! You’ll have to act fast though…that coupon code expires TODAY (11/1).